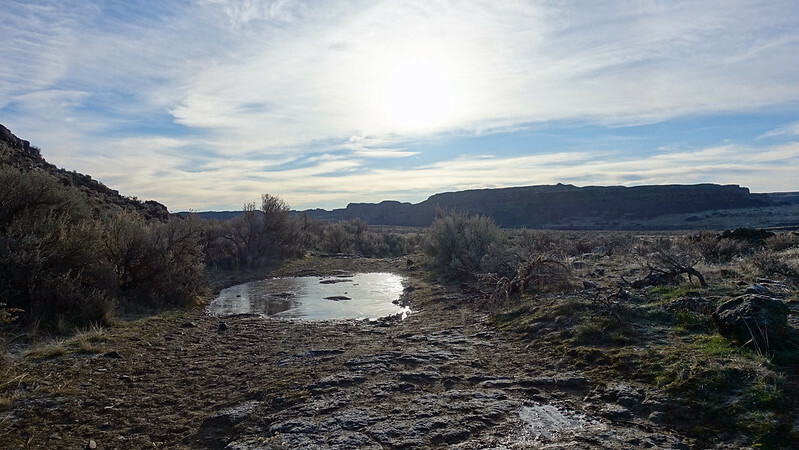 It is often hard to believe a forecast of a single sunny, blue sky day book-ended by bad weather in January, but I hoped for the best and prepared for the worst a hiker has to do what a hiker has to do so with that in mind we were off to Ancient Lakes / Pothole Coulees West of Quincy, WA. located in the Quincy Wildlife Refuge. The area has an incredible geologic history resulting in the formation of the scab-land coulees which make for scenic exploring. Noticeable this year was the absence of snow in this El Nino pattern driven winter compared to past years, we had frost, but no snow on the ground and the lakes had only thin partially covered areas of ice and some had no ice at all. We began at the TH hiking into the Northern most coulee and headed back towards “Ancient Lake Waterfall” where we headed SE and gained the upper bench which allows for nice travel above the main coulee floor, but below the ridge separating both coulees referred to as, “The Blade” by geologist. The path along the bench allows you to access “Dusty Pass” and it is here where many people make connecting loops and / or visit Dusty Lake we stopped for some views and pictures before continuing E still on the bench to a ridge break where we scrambled up to the top of the flat ridge which feels like a scab-land island in the sky following it back to the high-point of around 1318′ and beyond to a distinct elevated basalt knob where we had lunch in the warm sun looking up and down the Columbia River. After a lunch break we followed the “Blade” E to the end looking for a direct route down and onto Babcock Bench and the main trail but there didn’t seem to be a safe scramble route especially from the high end so we hiked back found another break in the ridge and dropped down to the S coulee where Dusty Lake resides out and back to the vehicle. We ended up with good weather and views for a total of 8.5 miles and 1500′.